Wal-Mart Stores, Inc. (WMT) operates retail stores in various formats worldwide. It operates retail stores, restaurants, discount stores, supermarkets, supercenters, hypermarkets, warehouse clubs, apparel stores, Sam’s Clubs, and neighborhood markets, as well as walmart.com; and samsclub.com. 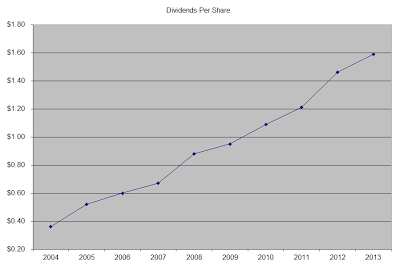 The company is a member of the dividend aristocrats index, has paid dividends since 1973 and increased them for 39 years in a row. The company has managed to an impressive increase in annual EPS growth since 2004. Earnings per share have risen by 10.60% per year. Analysts expect Wal-Mart Stores to earn $5.30 per share in 2014 and $5.82 per share in 2015. In comparison Wal-Mart Stores earned $5.02/share in 2012. On average, Wal-Mart has also managed to repurchase approximately 4.08% of its shares outstanding each year over the past five years as well. Its international segment however is expected to have low double digit growth in square footage, International currently represents an important opportunity for growth, as it only generates one third of the company’s revenues. Future growth in its international segment could come from acquisitions, as well as organic growth. Wal-Mart is just getting started in certain key markets such as China and India for example. The combination of rising populations, increasing per capita incomes and providing an efficient retailing experience, are some of the characteristics that could fuel growth in international. 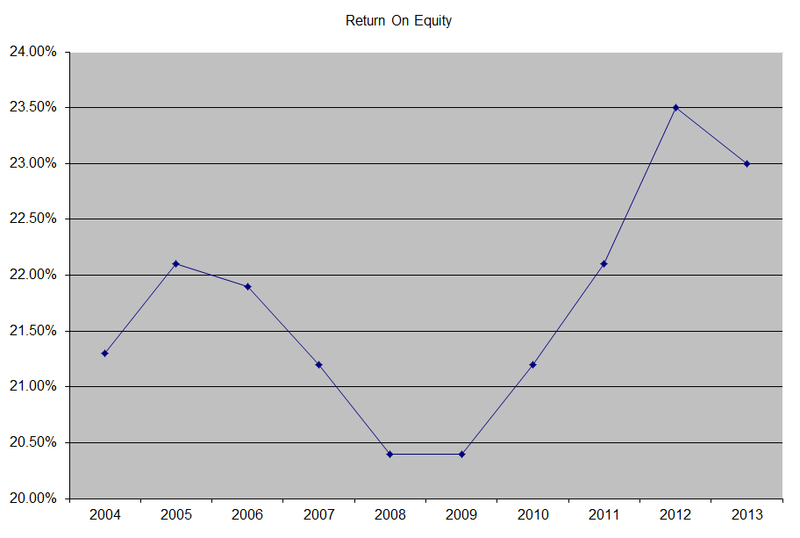 The return on equity has remained consistently above 20%, and has increased to 23% by 2012. Rather than focus on absolute values for this indicator, I generally want to see at least a stable return on equity over time. The annual dividend payment has increased by 18.10% per year over the past decade, which is higher than to the growth in EPS. An 18% growth in distributions translates into the dividend payment doubling every four years. If we look at historical data, going as far back as 1976 we see that Wal-Mart Stores has actually managed to double its dividend every three years on average. 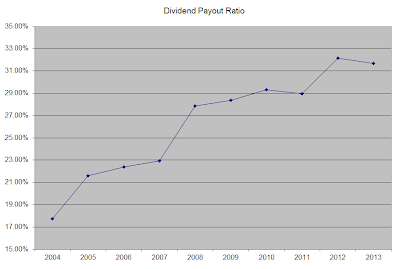 The dividend payout ratio has increased from 17.70% in 2004 to 32% in 2012. The expansion in the payout ratio has enabled dividend growth to be faster than EPS growth over the past decade. A lower payout is always a plus, since it leaves room for consistent dividend growth minimizing the impact of short-term fluctuations in earnings. Currently, Wal-Mart Stores is attractively valued at 14.30 times earnings and has an adequately covered dividend but only yields 2.50%. In comparison, Target (TGT) trades at 15.40 times earnings and yields 2.50%.